Just like its close cousin the dwarf sperm whale, the pygmy is a relatively small-sized whale. In fact, it’s not much larger than many dolphins. They have a bluish gray body with a creamy/pink belly area. This species is known for a large shark-like head. The head is so large compared to the body that it gives it an almost swollen and disproportionate appearance. Pygmy sperm whales have a very small and low slung lower jaw and a single blowhole slightly off-center. They have very small and hooked dorsal fins. Like other sperm whales, this one also has a spermaceti organ in its forehead. And it has the ability to suddenly eject dark red fluid to ward off would-be predators. The dwarf sperm whale and the pygmy are the only cetaceans that have this property. Males grow to 2.7 meters and females 3.8 meters. From 400 kg (880 lbs) to 450 kg (992 lbs). These whales are slow and deliberate swimmers. They prefer to rest and float motionless at the water surface. Fortunately for this species, the pygmy sperm whale has never been a direct target of wide scale hunting. However, a few whalers have hunted them from countries such as Indonesia, Japan, and the Lesser Antilles. Other threats to this animal include getting killed in drift nets, swallowing large quantities of plastic waste, and captivity. Pygmy sperm whales do very poorly in captivity. Consequently, captive specimens die in a few months mainly from dehydration or dietary related problems. They are also shy around boats and will not usually approach them out in the wild. They like to travel alone or in small groups of six or seven animals. The Pygmy Sperm Whale is not very vocal but will use echolocation clicks to locate prey. Information for this species is still sketchy but it is believed that they mate from April to September in the southern hemisphere. Gestation lasts 11 months but unlike other cetaceans, they give birth to their calves head-first. Newborn calves measure about 1.2 meters (3 ft 11 in) long and their mothers wean at around one year old. The pygmy sperm whale eats squid, octopus, deep-sea shrimps, and rarely fish. Natural predators may include the great white shark and the killer whale. The Dwarf and Pygmy Sperm whales are the only cetaceans that can eject “ink” to deter predators. Just like squid do. 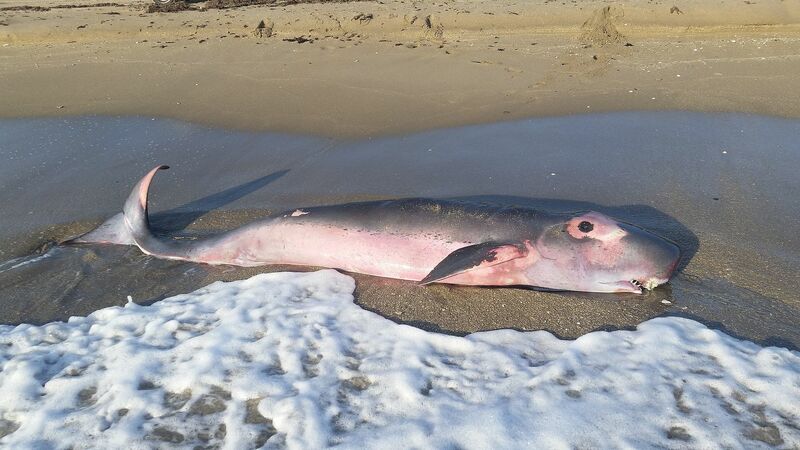 The population of this whale remains unknown. However, it’s protected under several agreements including the Agreement on the Conservation of Cetaceans in the Black Sea, Mediterranean Sea and Contiguous Atlantic Area and the MoU for the Conservation of Cetaceans and Their Habitats in the Pacific Islands Region (Pacific Cetaceans MoU). For now, the IUCN lists it as a Data Deficient species. The pygmy belongs in the family Kogiidae and the genus Kogia along with the dwarf sperm whale. Both these species were regarded as one till a scientist at the Smithsonian Institution in Washington DC determined that they were really separate species in 1966. Henri Marie Ducrotay de Blainville was the first person to name the pygmy sperm whale in 1838. Along with the dwarf whale, the sperm whale is also a close relative. Though very rare, pygmy sperm whales live throughout the tropical and temperate waters of the Atlantic and Indo-Pacific Oceans. Occasionally, they may swim as far as the colder waters off Russia.